Most of the houses that surround Chatham University on Woodland Road, look the same, a version of a brick Tudor-style house. Even if you cannot see into the houses, you just sense that the interiors of theses house have lots of woodwork and some heavy draperies covering each window. But there is one house on Woodland Road that stands out from the Tudor line up. If you have driven down Woodland Road, you have likely seen the Giovannitti House. I don’t believe this house has a historic designation, but it is such a unique building that it is worth sharing for preservation month. The house was designed by architect Richard Meier, and was built 1979-1983. In 2013, someone started making a documentary about this house. I don’t know if they ever completed the entire episode but the trailer offers a look inside the house and an introduction to the owners, who were moving back into the house after having been away. 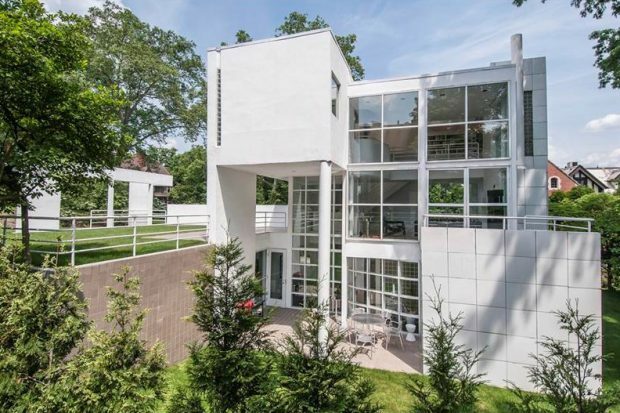 While researching this house, I came across the Pittsburgh Modern website, which has a detailed list of other modern buildings around Pittsburgh. It looks like the site has not been updated in a few years, in spite of that it is still a good starting point to learn more about modern architecture and architects in Pittsburgh.